INTERVENTION is urgently required to safeguard the future of the Australian meat processing industry, as it deals with operating costs which are dramatically higher than key global competitors, according to the Australian Meat Industry Council. Responding to yesterday’s release of an independent analysis of regulatory and related Costs in red meat processing commissioned by the Australian Meat Processor Corporation, (click here to view yesterday’s report), AMIC chief executive Patrick Hutchinson said the document offered a stark illustration of how difficult it was for Australian processors to compete. The red meat processing sector, of which beef processing is the largest contributor, is estimated to have contributed over $21 billion in value add to the economy in 2015/16, including $8 billion in household income and nearly 130,000 jobs. The report found that average cattle processing cost per head was 24pc higher in Australia than in the United States, 75pc higher than in Argentina and more than twice as much as in Brazil. “AMIC’s members are providing jobs to local communities, they’re producing high quality meat products, they’re doing everything right. But when you consider that about 80pc of Australia’s product is exported, its easy to see how sky-high operating costs that outstrip those of our competitors are crippling the industry,” Mr Hutchinson said. The AMPC report shows regulation and certification are major contributors to this disparity, with more than half the costs in Australian processing (excluding livestock purchase) due to some form of regulation. Labour is also a significant factor in cost-to-operate discrepancies across markets. AMPC’s report found labour-related charges make up nearly 60pc of total operating costs in Australian facilities, compared with less than 50pc in the other countries examined. “Energy costs were also much higher in Australia than in the US or Argentina,” Mr Hutchinson said. He said AMIC was calling on state and federal governments to work with industry on finding ways to bring down the cost to operate. Many processors capture methane off their anaerobic ponds and use it to run their plant. Processors need to be encouraged to optimise the use of this process and reduce their energy costs. Others burn coal and wood chips to run their boilers. They also manage the start up of machinery to ensure they do not create a maximum load factor on energy use at the start of the shift. I am sure there are many ways processors work to reduce their purchased power and we need specialists to review all abattoirs to ensure they are doing all they can to reduce their energy costs. Regarding the cost of labour, can we remove the middle men who bring in the 457 employees? They are earning excessive profits from this process. When leaving a bank in Naracoorte a few years back, I was approached by one of these middle men asking if he had deposited $15,000. There was a suburban house where 17 457 visa holders lived all paying $100 a week to the middle man for their accommodation. He would take them for a local pub meal and charge excessive costs. The abattoir pays the full wage for the 457 employee but they would receive only $12 an hour after the middle man has taken his share. The 457 employee is happy to receive this reduced amount as it is considerably more than they can earn in their home country. They are also working to gain residency in Australia. Some abattoirs have in excess of 80% 457 visa employees in their workforce. Would we not be in a better position if the processor paid a special award to 457 visa holders consistent with their current home earnings. The processor should arrange accommodation and meals. Ted Brorsen when he was alive had a programme at Tabro Meats to bring aboriginal youth from Queensland to work at Lance Creek. They were mentored by a couple and provided accommodation and meals. I believe Noel Pearson was involved in this programme. 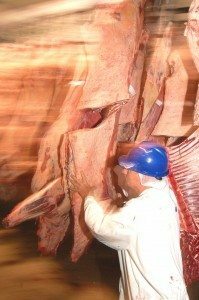 Sourcing qualified labour is a consistent problem for an abattoir operator. Colin McKenna at Midfield never employed people from other abattoirs. He worked with those committed to his business and built up a loyal and strong team. He has built a successful business with similar principles. The Australian Beef Industry Foundation is a charity raising funds to inspire careers in the beef industry. We offer scholarships to attend leadership courses and increase their commitment to our industry. We also support those looking to improve their education standards to work in the beef supply chain. Processors are involved in this effort with in-house programmes. AMPC needs to work harder with their levies addressing the issue of labour shortage, labour training and identifying ways to improve mechanisation so the labour cost can be reduced.